Estimating software that’s crazy simple to use for plasterboard installation. 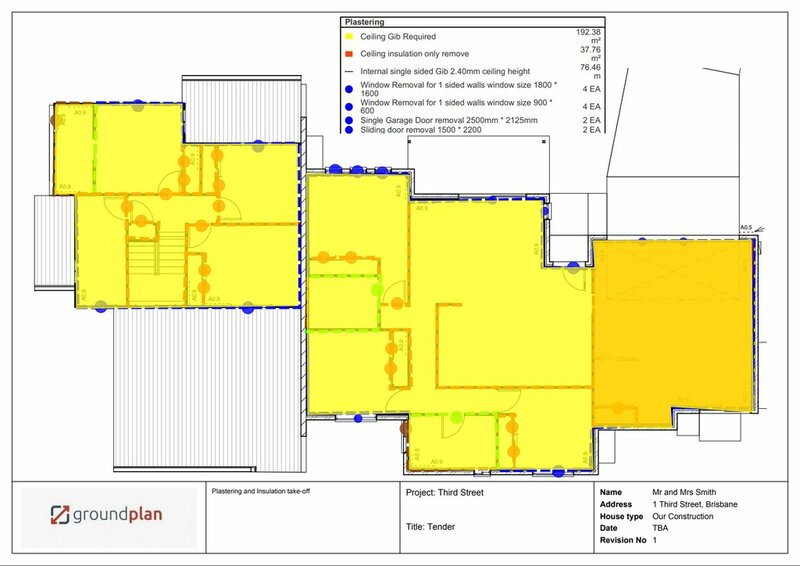 If you’re still using the old-style approach with a highlighter, paper and pen, it may be time to consider the long hours saved by using Groundplan, the best cloud based estimating software for plasterboard installation. How does this estimating software help to install plasterboard? Upload your PDF plan and set the scale. For instance: A3 @ 1:100. Name your ‘Stage’, it may be ‘Interior Walls’ for instance. Set your ceiling heights, and you’re off. Whip around the plan and trace the walls as Groundplan begins calculating the measurements and the associated costs. You can choose whether the wall is double-sided or single-sided, so there’s no need to measure the same wall twice. Next, show Groundplan where the windows and doors are. Then, grab the ‘Area’ tool and draw out each of the ceilings. It’s up to you how much detail you’d like to gather. You can deep-dive into the detail, but many plasterboard professionals use it to simply count, measure and calculate. 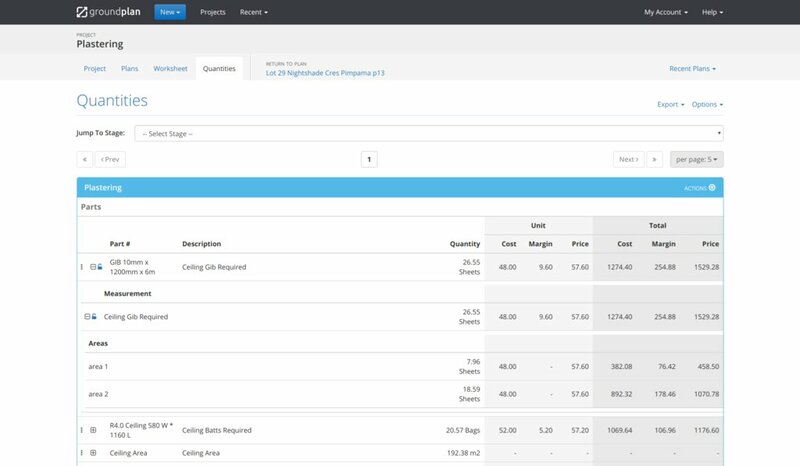 Schedule a Free demo with one of our qualified trades experts today by signing up to our free trial. The changes we’ve made are saving us around $500,000 per year. What time of day do you get to your quoting? Hopefully the quoting is not still being done when you’d rather be getting some well-deserved down time after the kids have gone to bed. You’d rather be kicking back enjoying some TV right? Quoting after hours is a big issue for many business owners and it’s time you got on the front foot. We all know the old method worked ok. It’s been around for years, so why change? Well, for one thing, your competition are likely thinking about upgrading, if not already. Why did they win the job and not you? They likely got the quote out quicker and if they were using Groundplan, the estimate looked pretty slick too. 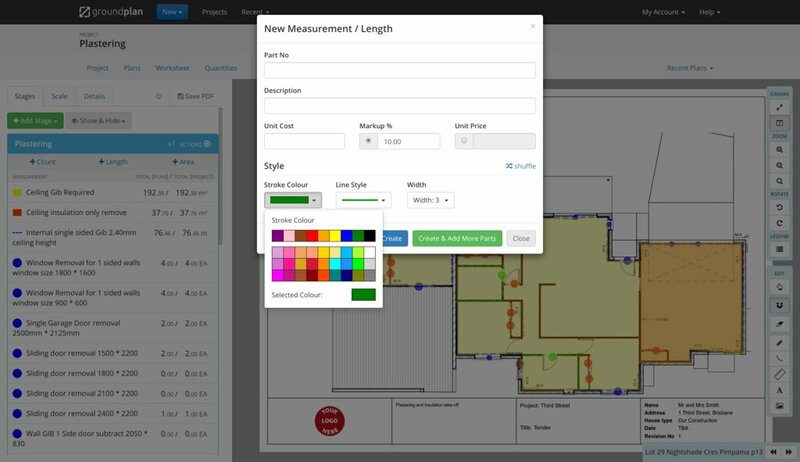 Groundplan digitally measures walls and ceilings to more accurately estimate how much plaster you’ll need and how much time your plastering job will take. We all know what happens when you rely on the builder to calculate measurements right? That work order was for 300 sqr meters. Then why is there actually 350? With the time it’s likely taking you to get those quotes out the door, no wonder it’s tempting to take the builders word for it. The accuracy of these measurements affects your margins, and what’s the point of doing a job if you’re not making money?! 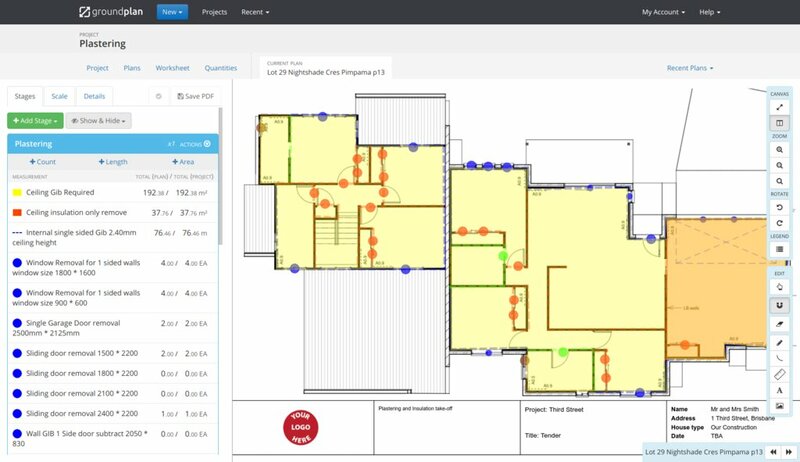 Alternatively, you have the opportunity to employ a professional estimator to do your plasterboard calculations for you, as Groundplan is a cloud-based software and can be used anywhere. At any stage you can login and watch the estimate taking shape, while you get some of that well-deserved down time. Groundplan is just so much simpler to use than the others. So, you’ll need to make some measurements based on linear lengths. Sorry, but there’s no more need for that trusty plan wheel. Set your scale inside Groundplan and use the mouse to quantify your lengths. Put your best foot forward – don’t quote cheap, quote with accuracy and impress those clients with the best estimating software available for quoting your next plastering job. Groundplan produces a succinct and visually impressive estimate with all your branding in place ready to show your client, so you can look the part as the professional you are.